Bill Saunders (Born March 7, 1948) is a fine artist born in Province of Quebec, Canada. He started sketching at the age of 4 and painting at the age of 12. At the onset, Saunders used oil paints but he later switched to acrylics as that performed well with his technique. Due to his attention and expression of detail, he chose realist style art. Although he started painting as a hobby, people began to recognize his works, driving him to take his painting even more seriously. In 1977, Saunders decided to quit his job at a refinery to concentrate on his painting work since that's what he was passionate about. It all began as a challenge, but after some time, door began to open. He has utilized his painting skills to touch the lives of many by capturing the beautiful rural scenes through his brush strokes, bringing the seemingly rustic surroundings to life. He focused on painting farmlands, farmhouses, and a host of other things found in Quebec and Ontario. Saunders’ art is available in numerous galleries and collections across Canada and sections of the US. He has confessed that his love for painting is only second to his love for his family. His biggest inspiration is his family, his pets and the nature that surrounds her. Saunders’ subjects are a collage of both human figures and beautiful scenes and North American countryside that he travels extensively. The scenes he picks are specific ones that he intends to preserve through art. 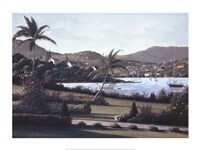 Saunders’ creative works are availed in limited editions and are also produced through calendars and posters. In Canada, his art is managed by Koyman Galleries.